For the first time, Democratic candidate for Virginia governor Terry McAuliffe said he supports the recently-proposed Environmental Protection Agency emissions rules for future coal-fired power plants. The emissions caps have become an important issue in the Virginia governor's race. GOP opponent Ken Cuccinelli has accused McAuliffe of "waging war on the coal industry" and has been pressing for a reaction to the proposed rules. When the guidelines were announced Sept. 20, McAuliffe told reporters he needed to review them. 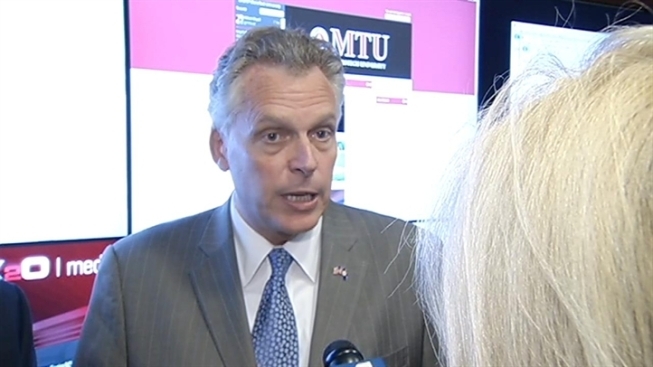 Tuesday, as he toured the offices of a Tysons Corner government contractor, News4's Northern Virginia Bureau Chief Julie Carey asked McAuliffe whether he had come to any conclusions about the proposed emissions cap. Initially McAuliffe replied, "We have no permits requested for future plants. I think we have to look at when permits [for new coal plants] come in and how it applies." Then when asked whether he supports the guidelines as they are written, McAuliffe said, "I do. You bet. What I've looked at I support, what we need to do to protect our air and water"
McAuliffe added he wants to protect current coal industry jobs. "If we have to fight the administration on certain issues that don't make sense for us, we will [fight]," McAuliffe said. In a statement, Cuccinelli quickly pounced on McAuliffe's remarks. He said that in 2009, in his first run for the Democratic nomination for governor, McAuliffe said he never wanted another coal plant built. "Today, my opponent finally admitted his full support for the War on Coal by endorsing the EPA’s new regulations... It demonstrates my opponent has been deliberately misleading Virginians during this campaign by suggesting he supports the coal industry," Cuccinelli wrote Tuesday. Cuccinelli has said he is opposed to the proposed guidelines and believes they will cost jobs, especially in Southwest Virginia.